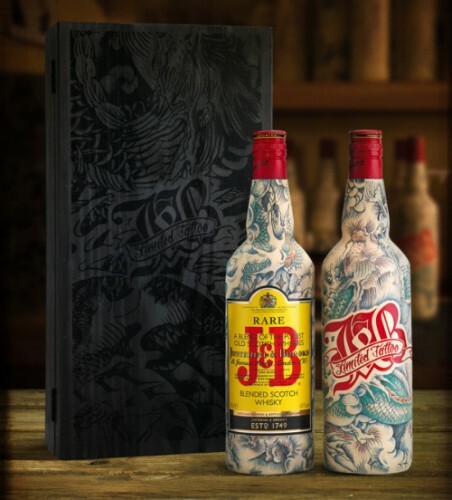 Tattoo parlor Le Sphinx Paris teamed up with J&B to create these ornate bottles, each of which took 20 hours to complete. 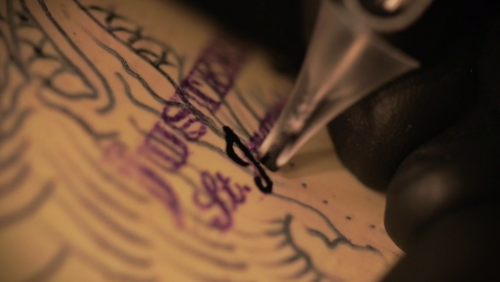 The history of both Western tattoos and J&B scotch-blend whiskey dates back to the 19th century. Justerini & Brooks dared to make its own brand of house whiskey, while Royal Naval Sailors came back from trips to Asia and the South Pacific bearing colorful tattoos. 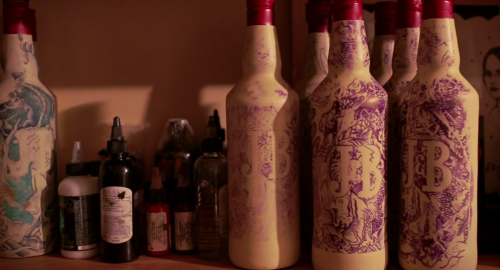 The trend began to spread throughout Europe, and in 1862 even Prince Bertie (who became King Edward VII) sported a tat, according to Button Button, the design studio behind a new series of limited edition J&B bottles sporting old-fashioned seafaring tattoos. Whiskey probably also played a large role in the ease of tattooing, especially for burly dockside sailors—after all, this was before studios made customers sign the “I have not been doing tequila shots” waiver. To celebrate the long tradition of boozing and tattooing, celebrated studio Le Sphinx Paris decided to give its old friend J&B a new sleeve tat. To stay true to tradition, the artists decided to avoid printing a design on the label and calling it a day. Instead, marketing firm Button Button created latex “skin” for each limited-edition bottle, so that Sébastien Mathieu, Le Sphinx’s owner, could do his work the proper way. 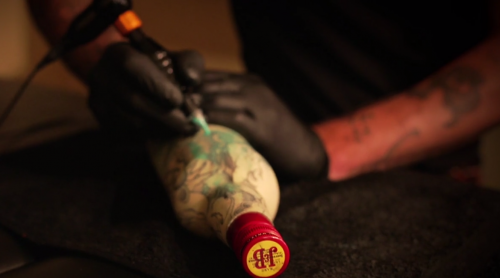 This was no speedy operation—each bottle took around 20 hours to tattoo. Each of the 25 limited-edition bottles, sold in rough black silkscreened wooden boxes, was created from the same design but became one-of-a-kind once tattooed. The collection is on sale in Paris at Publicis Drugstore and at L’éclaireur rue Herold. 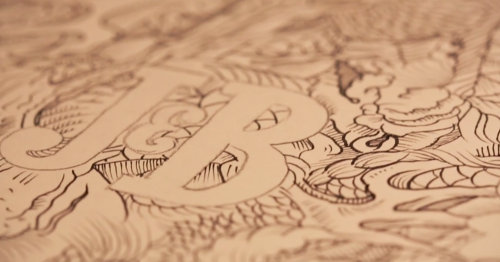 Watch the video above to see Mathieu tattoo the J&B bottles.